During the day, most huntsman prefer to rest in retreats under bark, crevices or other protected areas. This is why so many people encounter the spiders under the sun visors of their cars or behind curtains in their homes, because those are perfect tight spaces for a sleepy spider. In order to mate with virgin females, male huntsman often search out females that are not quite mature and guard them for long periods. 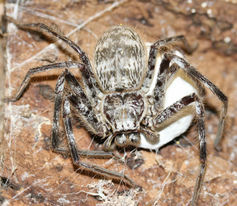 All huntsman females are attentive mothers who actively guard their egg sacs and new-born offspring for around three weeks. 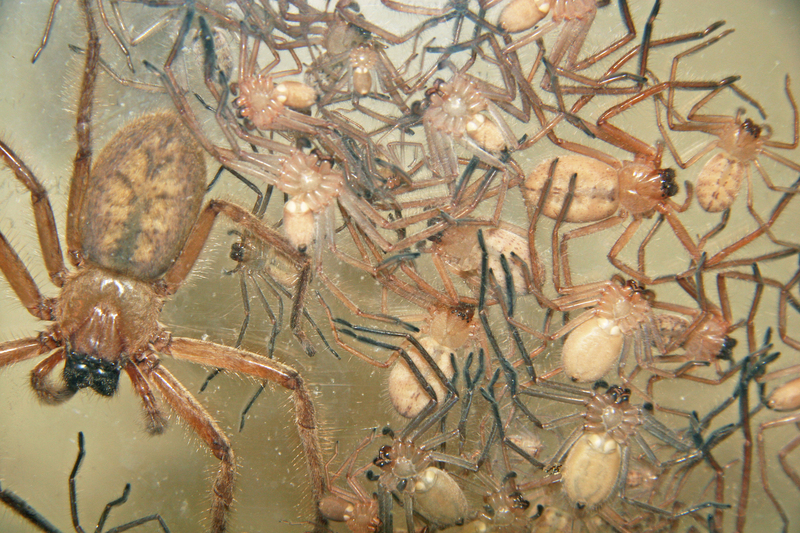 For most huntsman species, these are the only social interactions they experience in their entire lives. But the social huntsman, Delena cancerides, lives in complex family groups up to 150 strong, led by a dominant matriarch. 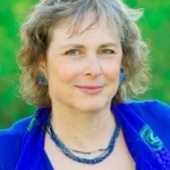 A single mum establishes a retreat under bark of a dead tree. Her offspring from one to four clutches remain with her until they reach sexual maturity at almost a year old. 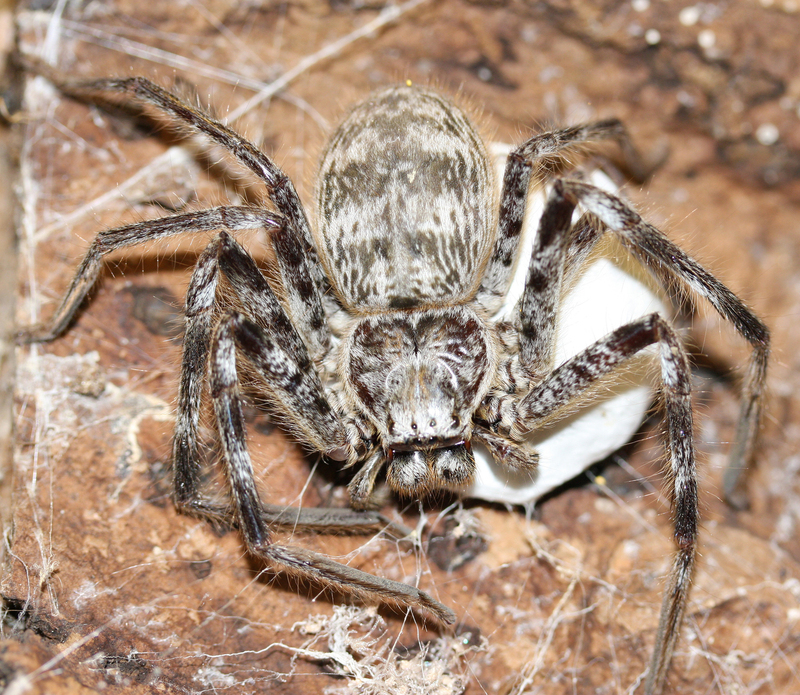 Peeling off bark to find a family of these spiders can be quite a shock. These social huntsman aren’t found in our homes, although I’ve heard of them establishing colonies under window shutters. One long-lived colony was in a backyard where the bark retreat had been affixed in place by a laundry line. 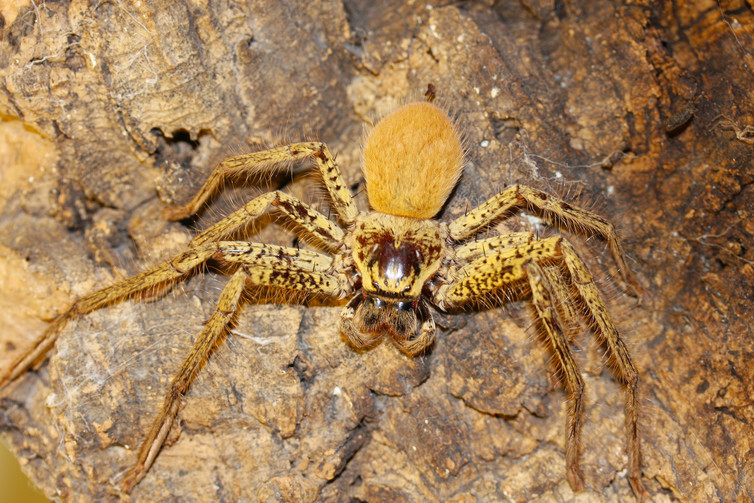 Conflict and cooperation in Australian huntsman spiders. As a result, there is strong competition among D. cancerides for each retreat, and larger females can displace smaller females. We believe that by remaining in the protected shelter of home until they are young adults, the spiders are larger and more competitive in the battle over bark retreats, which are an absolute necessity for raising their own young.